Congratulations to Chloe Stoops, winner of the Water Safety competition which was done as part of the Drowning Prevention activities at Richhill Recreations Centre’s Summer Scheme . The prize, RLSS Water Bottle and a set of Rookie Lifeguard Lessons in the Orchard Leisure Centre, was presented by the Lord Mayor of Armagh, Banbridge & Craigavon Borough Council, Councillor Gareth Wilson; also included in the picture is Mark Wilson, Chairperson of Royal Life Saving Society, Northern Ireland Branch. 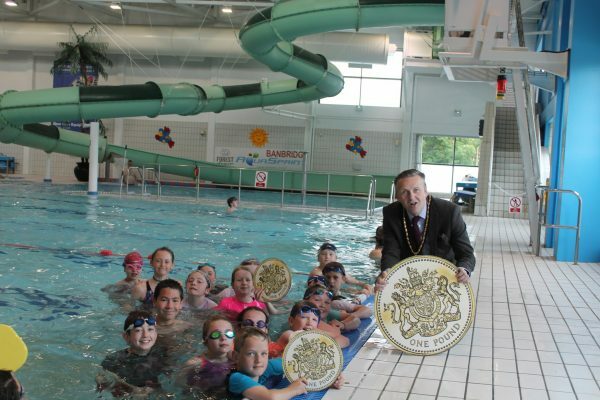 Armagh City, Banbridge and Craigavon Borough Council are making a splash with the return of the £1 Junior Swim offer at leisure centres across the borough. Banbridge Leisure Centre, Cascades Leisure Centre, Craigavon Leisure Centre, Orchard Leisure Centre and Waves Leisure Complex will all be providing the popular deal which allows children and young people living in and around the borough to enjoy a swimming session this summer for just £1. Speaking at the launch of the scheme at Banbridge Leisure Centre, Deputy Lord Mayor, Councillor Sam Nicholson said: “It is fantastic that the council are once again offering this opportunity for young people. Not only is it a great value for money activity allowing you to spend a day with friends and family it is also a wonderful way to stay active and keep fit during the summer holidays. Also as a former lifeguard at the Orchard Leisure Centre in Armagh I fully understand the importance of young people being able to swim so I welcome the council continuing this excellent incentive. The £1 Junior Swim will run from the 1 July until 31 August 2017 and is available for anyone under the age of 18. Children under the age of eight are not permitted to use the swimming pool without being accompanied by an adult. Children aged four and under can swim FREE at any of the Armagh City, Banbridge and Craigavon Borough Council pools all year round. Swim times and pool opening hours for all participating centres are available online at www.getactiveabc.com or alternatively contact any of the leisure facilities directly at Banbridge Leisure Centre T: 4062 8800, Cascades Leisure Centre T: 3833 2802, Craigavon Leisure Centre T: 3834 1333, Orchard Leisure Centre T: 3751 5920, Waves Leisure Complex T: 3832 2906. Children from Richhill Recreation Centre’s Summer Scheme who attended a Safety Session provided by NI Networks on the dangers of overhead powerlines, substations and pylons.